The Stocking Stufftacular is an NC Mall event in the month of Celebrating with a new gift appearing every morning from December 8th through January 1st. To participate, purchase your ticket pack and hang a stocking each night to receive your gift! To participate, purchase a Stocking Stufftacular Stocking Pack from the NC Mall. To activate the Stocking Pack, visit your inventory and click on the ticket. Select the activation option. You can now visit the Stocking Stufftacular page and select the places you would like to hang your stockings. Note that the ticket packs above begin expiring on December 7th so that you do not buy a ticket pack greater than the number of days remaining. You can always buy multiple lower denominations. You must, at the latest, hang your stockings by 11:59pm NST the night before in order to receive your gift. For example, to receive a gift on December 8th, your stocking must be hung by December 7th at 11:59pm NST. If you miss the deadline, you will not receive the item for that following day. You can hang stockings days or weeks ahead of time if you don't want to deal with remembering the deadline. Once hung, a stocking cannot be moved to a different day. You may hang up to five stockings for any given day (i.e., up to five stockings on the same peg). If you do, you'll receive multiples of the item(s) given out that day (bonus items are the exception to this rule; you will only receive one bonus item). Items are given out daily at 5:00am NST, starting on December 8th. This means if you want that first gift, you have to hang a stocking on the first peg by 11:59pm NST on December 7th. If you have further questions, please visit the Official Stocking Stufftacular FAQ. Below is a list of prizes and the day they were released. You will not be able to receive prizes from past days, so make sure to hang your stockings by 11:59 PM NST the day before. 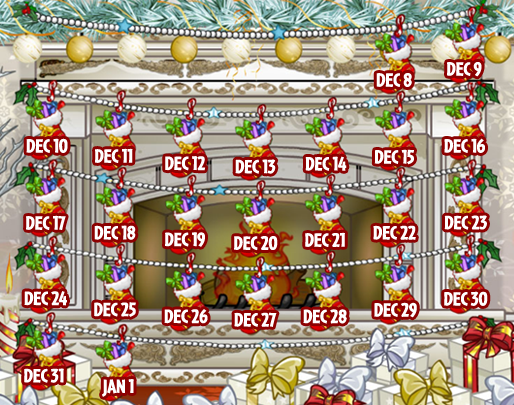 If you end up with extra stockings, don't forget that you can use up to 5 stockings on each peg to receive up to 5 of the same prize!